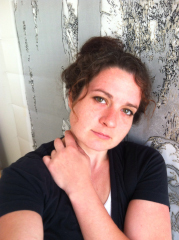 Painting on silk allows artist Emily Erb to create fluttering works of uncanny beauty and detail, dense with images. The material has rich associations for the artist, both for its historical significance and its physical properties. Once used as currency in China, silk offers a tightly woven and high-sheen surface, coupled with great flexibility and light weight. Her paintings may hang from flagpoles or float in space, emphasizing the elegant lightness of their silk grounds. In her World Map, Erb substitutes landmasses and bodies of water with images of people and animals. Teeming populations of animals and humans suggest both the order and chaos of life in various parts of our world. In this piece, I formed the continents out of people and filled the seas with fish swimming in the directions of the currents. My source material for all the people is exclusively from the LIFE World Library series from the late ‘60s and early ‘70s.